Read on below for a character profile of Vive Tarkenwore, from The Stratus Estate! Meet Phillip Stratus, a boy who lives in the very distant, utopian future. There's something different about Phillip. He lives with his large, quirky, adoptive family, all of whom are powerhouse players in the city where they live, the City of Tarkenwore. His best friend is Vive Tarkenwore - heir to the prodigious throne of Earth. Vive is the conceptual child of Queen Nacthelian and King Hasamelis, very tall supernatural beings who have ruled the planet for almost 2,000 years. Phillip and Vive have many unusual adventures together before they reach the age of 14. But all this isn't exactly what makes Phillip different from all other Terrans. Vive Tarkenwore is a fourteen-year-old girl. She goes to school. She does homework, goes to dance class and hangs out with her best friend, Phillip Stratus. That’s where any typical-ness about Vive ends. The details of her birth are unknown to even her and her adoptive parents, but it is said that she was woven from space and stardust by preeminent rulers of Earth, Queen Nacthelian and King Hasamelis. Although the crown princess, Vive has little real contact with her ‘birth’ parents while they control the fate of the Solar System like conductors of an astronomical symphony. Her adoptive parents, the Masters Masachi, are reserved and severe, but also incredibly wise. They have an enormous capacity for compassion in a quiet, dignified manner. Surrounded by responsibility and expectations, and carrying the weight of the world on her shoulders, it is not surprising Vive befriended Phillip, a chronic underachiever with a cynical sense of humor and a large, eccentric family. The Stratus Estate becomes like a second home to Vive. Phillip and his many family members, who all live at the estate, fill an emotional hole for Vive. Being preternaturally gifted, she doesn’t really fit in with her classmates. There’s little fun to be had with the Masters Masachi, and the Queen and King baffle her as much as any other Terran. But at the Stratus Estate, Vive fits in. She can be her optimistic, inquisitive self. She can laugh, and cry, and work, and play without feeling as though the universe depends on every step she takes, even if it does. 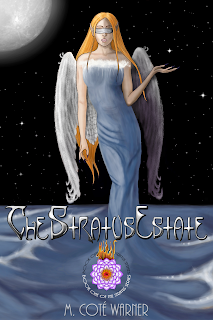 Although The Stratus Estate is told from Phillip Stratus’s perspective in journal style, Vive and Phillip’s destinies are irrevocably intertwined. Vive oftentimes appears to be a normal adolescent girl, but she is also intelligent and talented on a level that is difficult to relate to. Phillip is not only the storyteller, but also Vive’s translator. Phillip can relate to Vive, and they share a deep connection. Perhaps Phillip has more in common with Vive than anyone could have guessed. By M. Coté Warner, author and illustrator of The Stratus Estate. Morgan Coté Warner was born and raised mostly in Anchorage, Alaska (she was born in Anchorage, and mostly raised there). She is an alumna of Soldotna High School, one of the better academic institutions of Alaska’s Kenai Peninsula, and the University of Hawai’i at Hilo. Dissatisfied with the real world, it was at UHH where she began to imagine and build the world and characters of Tarkenwore. The name Queen Nacthelian came to her in a dream in her college dorm room. Morgan moved back to Anchorage after spending a couple more years on the Big Island after graduating college and resumed a career in the human services. Despite a promising career, she was diagnosed with a severe and devastating chronic illness in 2010. After many years of sickness and being unable to work at much other than writing and creating a large portfolio of digital art, this, her first novel, is her reintroduction to the world of healthy, functional people. Morgan now lives in Eagle River, Alaska with her boyfriend and two goofy dogs.